Many diseases that lead to blindness, such as glaucoma and macular degeneration, are caused by the death of certain cells in the human retina that lack the ability to regenerate. But in species such as zebrafish these cells, known as Muller glial cells (MGs), do serve as retinal stem cells that are capable of generating new cells. 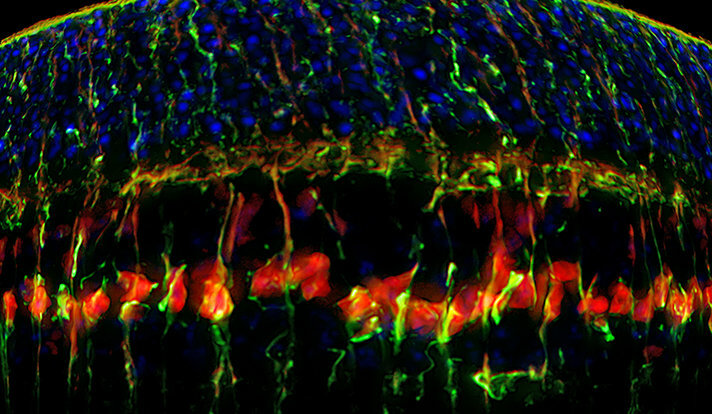 This image shows how transferred genes activate the stem cell properties of normally dormant retinal cells. In a new study, a research team led by Associate Professor of Ophthalmology Bo Chen investigated whether the regenerative power of cells in zebrafish could be recreated in mammals, specifically mice. The research team transferred genes into MGs to activate the stem cell properties of these normally dormant cells, causing them to reproduce and make other types of retinal cells. Read more about the study, published in Cell Reports. Story Source: Yale University. Original written by Ziba Kashef.